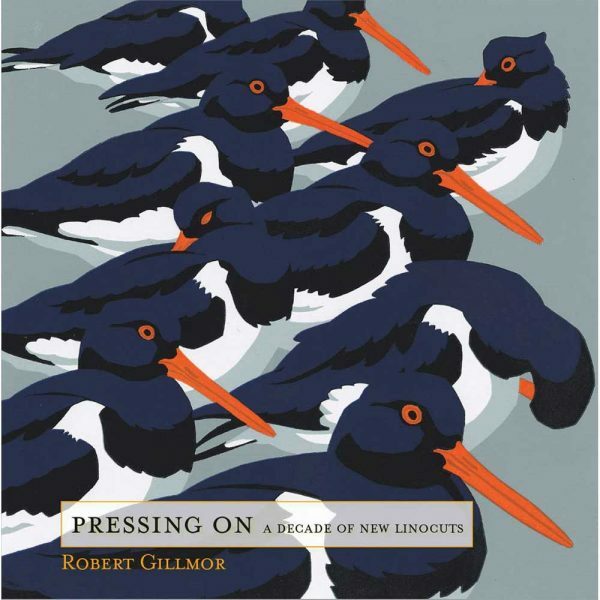 Pressing On – A Decade of New Linocuts by Robert Gillmor, published by Mascot Media features 160 reproductions of linocuts created between 2008 and 2018. Robert Gillmor is a renowned wildlife artist based in North Norfolk. In his long career he has designed book jackets for New Naturalist, stamps for the Royal Mail and many prints for exhibition. It is clear from this volume that he relishes his proximity to the wonderful birdwatching sites along the North Norfolk Coast, and his creative output continues to flourish. In 2015 he was awarded and MBE for services to wildlife art. The book is a hardback measuring 277mm x 277mm. Mascot Media is a publishing company based in the Norfolk Broads, that produces beautiful books. Their books promote art, artists, East Anglia and natural history. Conceived, designed, written, produced, published and printed in the UK – often in Norfolk. Run by Alan Marshall and Marion Scott Marshall who both have a wealth of experience in journalism and writing. Marion has been Editor of Connections, the John Lewis Partnership’s monthly magazine for its 15,000 retired Partners, since its launch in 2006. She also provides layout, editing and proof-reading services for all Mascot Media book titles. Alan has extensive experience as a journalist, author, book designer, and photographer. He has written on topics as diverse as guitar collecting, ceramics, ornithology, motor sports, aviation, photography, art, shipping, energy, engineering and travel. He is responsible for the written content and design of most of the Mascot Media titles.